Ishto Soh is a decently challenging shrine in Zelda Breath of the Wild. The challenge’s name – “Bravery’s Grasp” – gives a slight hint to the solution. Just like many other shrines, you can complete this one without following the designers’ wishes. With the help of two bombs and some arrows, you can completely avoid the main method. In this guide, we’ll give you a walkthrough of Zelda BoTW Ishto Soh shrine, to help you complete Breavery’s Grasp challenge. To reach the location of Ishto Soh, you’ll need to head to southernmost Hyrule. 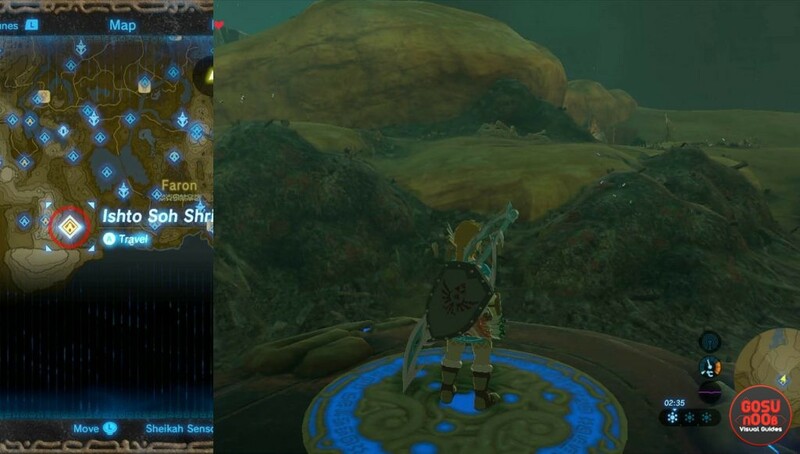 If you have Faron’s tower called Lake Tower discovered, glide southeast from it, towards Oseira Plains. Climb on the mountain west of Osiera Plains. There, you should spot what appears to be a junkyard, and the shrine is in the middle of it. You might recognize this area by the Secret of the Snowy Peaks puzzle, which is located just west from Ishto Soh. This is one of the easier shrines, if you are well informed how some specific mechanics work. In this case, it’s the laser found inside. It is a crucial key for completing the shrine quickly and efficiently. First of all, right from the shrine’s entrance, there is a chest on a lower level. Glide down and pick up the Topaz found inside. The next step is the crucial one. There is a laser blocking the entrance of the first treasure chest room. You can stop it from working by using the Stasis rune on it, but we don’t want to do this. The solution is rather simple. Get close to the laser box and pick it up. Now, just carry it to the moving platform, so that the laser points towards the orange crystal in the middle of the room. Put the crystal box on the platform and head to the entrance of the shrine. Pick up, carry, put down. The laser will do all the work, you just have to use it properly. From the entrance high ground, you can spot the laser doing its work. It will occasionally hit the center crystal and activate the shrine’s elevator mechanism. Look to the distance, and you’ll see another chest. Glide toward it, climb and pick up the Ancient Core found in there. The Ancient Cores are key ingredients for upgrading runes, and buying ancient armor and weapon set. You can also found all other Shrine Ancient Cores in our 120 shrine rewards & challenges guide. The movement of the platform’s laser will also allow you to reach the Ishto Soh spirit orb. Follow the movement of the rising platforms to reach it.